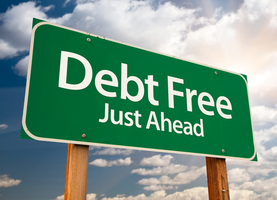 Wouldn’t it be great to live debt-free and not have to worry about making monthly payments to several credit cards? While it may seem impossible when you’re buried underneath debt, you can use the snowball method to start making headway on that debt. The debt snowball method works by starting with the smallest debt and getting it paid off before rolling the payment into larger debts. The snowball method doesn’t seek to save you the most money since you’re not starting with the higher interest rate, but rather the lowest amount of money owed. This method helps you stay motivated and feeling like you’re making progress toward paying off your debt. Here’s how to get started with the snowball method. List All Your Debts from Smallest to Largest. Every single bill you have should be listed on this. If you just got a $50 doctor’s bill in the mail with a $10 minimum payment, list it. Once you have all the debts listed, you have a better idea of how much you owe with a clear breakdown of each payment. Start by paying off as much as you can on the smallest debt. Once your smallest debt is gone, take the payment from it and start applying it to the next smallest debt while making minimum payments on your other debts. The reason this method is called the snowball method is that your money starts to get freed-up and grows like a snowball rolling down a hill. Focusing on paying those smaller debts frees up money to continue paying off the more substantial debts. This method of debt repayment is excellent for people who can easily lack motivation if they’re not feeling a progressive decrease in the amount of debt. Once your small debts are paid off, you can begin rolling those payments into your more significant obligations. For example, that $125 credit card payment you were making can be combined with the $25 minimum on it for $150 for the next payment. Once your second debt with a minimum of $75 is paid off, add that to the balance for a total of $225 toward the next debt. You can see how this method quickly compounds to help a user get out of debt. If you manage to acquire a new debt that is less than the one you’re currently focused on paying off, make sure you pay it off before starting in on your larger debt. Always be able to adjust your repayment strategy to accommodate for new, smaller debts that might appear. Following the snowball method is a sure-fire way to achieve your debt-free lifestyle. Sometimes your everyday spending can come to an abrupt crash if you find yourself in debt, so much in fact, that it is the same as fighting over who’s at fault in a car accident, so it’s time to take responsibility to get debt-free if you follow this simple principle. Some snowball method calculators are available online to help you decide how much you should pay on each bill as you work to pay off the smallest amount first.